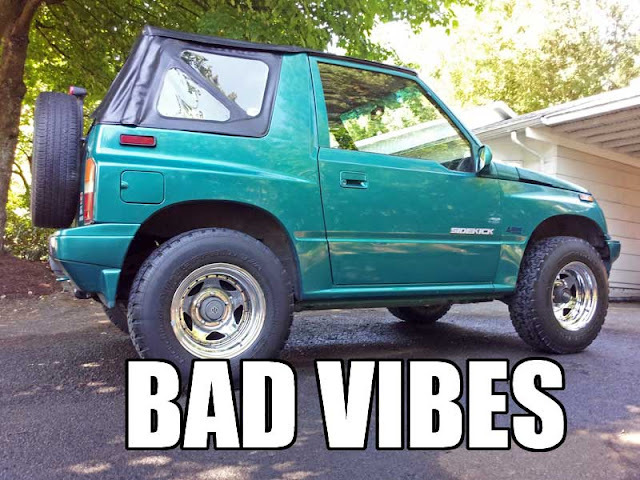 The "Teal Terror" (aka project Suzuki Sidekick) is the first RWD/4WD vehicle I've owned, and the highest mileage vehicle I've ever owned (143,000 and counting), so there are some issues I'm not familiar with encountering. Things like worrying about u-joints and worn out mounts. Lately, I've noticed that above 60 MPH I'm getting a nasty vibration—it shakes the whole truck. I'm not getting any steering wheel wobble; the whole darn thing just starts to shake. It's so bad that anything over 65 becomes unbearable. And although I don't drive it very often about 60, when I want to take it on longer trips for camping, exploring, etc., it's super annoying. I took the trucklet into the shop that originally mounted and balanced the wheels and tires to make sure I hadn't thrown a weight, etc. It was going to cost me $25, but at least it'd eliminate a variable. The tire tech said the wheels were slightly off, and the tires were starting to show their age. Fine. After the re-balancing, I took the rig up to 60+ MPH, and sure enough, the vibration was still there. Drat. Last night, I rotated the wheels/tires front to back and took the truck up to 60 MPH again, and sure enough, the vibration was still there. Double drat. I've pretty much ruled out the wheels or tires being the issue. So it's onto other things like the u-joints, which is likely what I'll have checked next. Other possibilities could be an off-balance drive shaft, perhaps a broken mount of some sort; who knows what else. I hope to have it fixed soon, since I plan on attending the Overland Rallies and Workshops event outside of Leavenworth, WA in July. Check the wheel bearings, ball joints, tie rod ends, and steering damper. All easy to do in about an hour with a good floor jack. Gimme a shout if you need help. No steering damper, so nothing to check there. Just had an alignment done a few months ago, so all ball joints/etc. should've been check out. Not sure about the wheel bearing thing. Wouldn't that make a good amount of noise? Front rotors are warped and need to be replaced. Not sure if that'd do it or not. Regardless, should be replaced (not sure about the rear drums, though). U-joints should probably be looked at, too. Wheels bearings may make noise only at certain speeds if they're just starting to go. Usually they also tend to make more noise when turning one way and the car leans on them. Just jack up the car and and grab the wheels and shake. 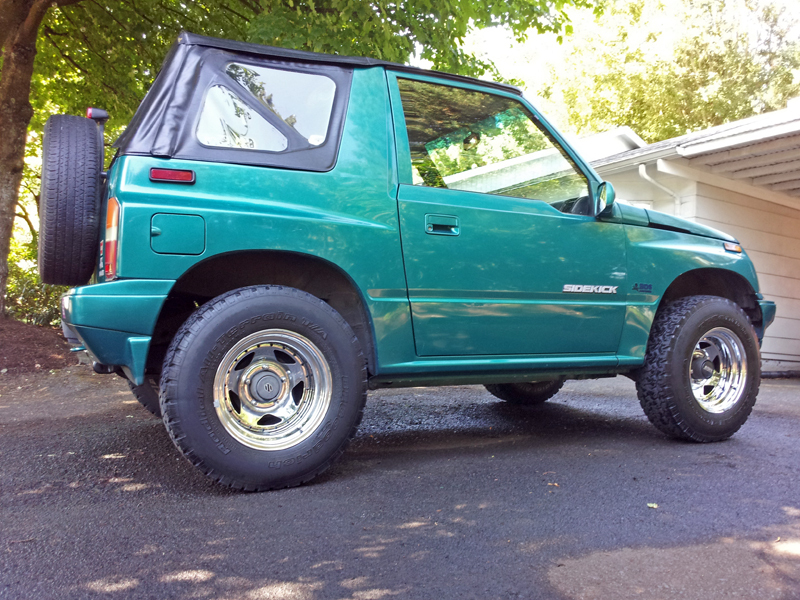 If there's play at the top/bottom, it's ball joints. Play side to side, tie rod ends. Play everywhere, wheel bearings or all of the above.